The Pebble smartwatch made ground-waves as one of the first smartwatches to be not only accepted by consumers but hit with overwhelming demand. Kickstarter, the popular crowd-source website, gave Pebble 80,000 backers and exceeded its goal by a few miles. Even though the demand for good solid items on Kickstarter brings developers in from all backgrounds, one of the main problems is getting the shipping on time. Many developers suffer from poor shipping and manufacturing, because of overwhelming demand. Pebble suffered from this and had to delay their smartwatch. Gradually, the company started working with Chinese manufacturers and are now on course to deliver watches as soon as January 23, but they will be in batches so we can expect it to be finished by March. The smartwatch has many features that a normal watch doesn’t. The watch connects to your phone and can receive notifications that alert you, the watch can also be a remote to change music. Pebble offers a few different watch interfaces. In terms of design, the hardware is pretty small, sleek and simple. Pebble haven’t put anything on the watch that might complicate things and the software is the same. A simple button interface for moving around the features and a back and press button. Pebble works with any Android or iOS smartphone that has Bluetooth connectivity. We believe Pebble are still working on some features of the phone that they added in the Kickstarter, like finding the range of your first shot when playing golf. While there is nothing specific about customisation, Pebble have said that developers can work and create their own watch interface. We are unsure if the company want a closed wall or open source software. Right now, the manufacturing company is making 15,000 watches per week and is expected to keep on track. Hopefully Pebble won’t encounter any more delays. You should have your watch, if you placed an order, soon. 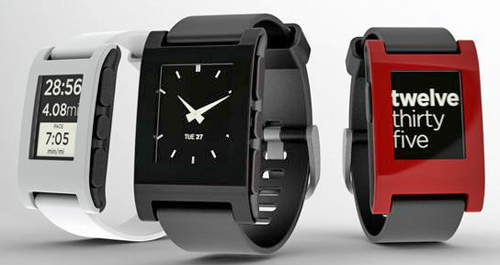 We believe Pebble will add this smartwatch to stores and online after shipping for the initial bunch has finished.